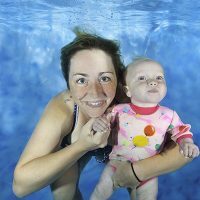 Take a once-in-a-lifetime opportunity with Aquastudios underwater baby photography to capture those split seconds where your child naturally opens their eyes, holds their breath and takes their first dive. The priority with newborns & babies is warmth. You will only have a limited time in the pool before your little ones will let you know they have had enough, so it is very important to go through what you want to get out of the session beforehand to maximize your time in the pool. There is absolutely no pressure in submerging your child, as images from the surface are just as great. 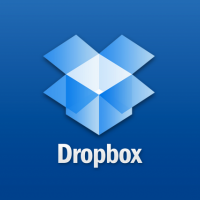 We want these sessions to be fun and for everyone to be relaxed and enjoy themselves. 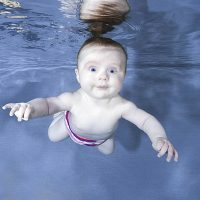 Your waterbaby’s inborn ability to swim naturally is what makes underwater baby photography so fascinating. With the help of 2 reflexes we are all born with they will look more comfortable submerged than most of us adults! Please do your own research on babies’ dive reflex (bradycardic response) and swimming reflex to ease any worries on your child’s safety.